I've been an automotive technician since 2001. European cars are my specialty, and I work on high-end cars like BMW, Mercedes, and Audi every day. I look forward to demonstrating my expertise to my customers. Khoa contacted me earlier to see if he could come out earlier to my appointment which was great! I had two of the low beam bulbs so he deducted that from my cost. Khoa worked through the two tasks quick in a hour and was able to explain the diagnosis and answer my questions. He was knowledgeable and professional. Will make him my guy. Great fast service, thank you Khoa! Showed up on time, very friendly, quick service, would gladly recommend to others. This was an amazing experience your mechanic was great. I was extremely pleased by Khoa’s promptness and professionalism. It was apparent that he had knowledge and skill. He worked quickly and thoroughly and neatly. He recommended steps to take after the repair and was courteous and personable. I will definitely ask for him if I need a mechanic in the future and will recommend him to others without hesitation. Arrived early and worked quickly. Would use again. This guy is outstanding. Changing the alternator on my car was quite the challenge! He pulled through and did not give up until everything was perfect! He even allowed me to fix my tire using my 12v compressor and his van! He is excellent and has excellent character plus professionalism! He needed some help because the job was stressful. My car is a P3 Volvo S80 V8 and it not always easy to deal with because of everything in the engine bay is so cramped for a transversely mounted 4.4L engine. He had to remove the control arm and the axel then he had to reach for the alternator in the wheel well. Not an easy thing considering the nut was torqued hard, and he needed an extra hand to unbolt it by keeping the old alternator steady and to but the control arm back (the hardest part). If you get Khoa as your mechanic, you will not regret it! Awesome service and thorough. 100% would set up another appointment with Khoa in mind. Thank you! At first I skeptical about this app and service but after Khoa replaces my front brakes I knew it was safe to utilize this service. He did a great job with my brakes so I wanted to use him for and oil change and spark plug replacement. 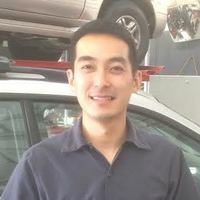 Khoa did a great job and I’d highly recommend him for servicing your vehicle. Khoa was professional, friendly and knows his business. I would definitely recommend his services. Khoa knows what he is doing. He was so quick and finding his own smart ways of getting the work done faster. Highly recommend him for service needs. Khoa was on time, and very friendly. Very pleasant experience. Khoo was on time, very straightforward and gave an honest assessment after diagnosing the problem. Knowledgeable and took time to explain the issue. I called Khoa to replace my thermostat since my 2003 beetle was throwing a code for cooling performance (P2181). Khoa came on time, changed the thermostat and also reset the code for me. I would definitively recommend him to anyone. Serviced car VERY EFFECIENTLY and fast. Definitely Recommend. Khoa was outstanding! He was on time, fixed the problem quickly with no mess or any surprises. I will definitely request for Khoa for any of my future auto service.